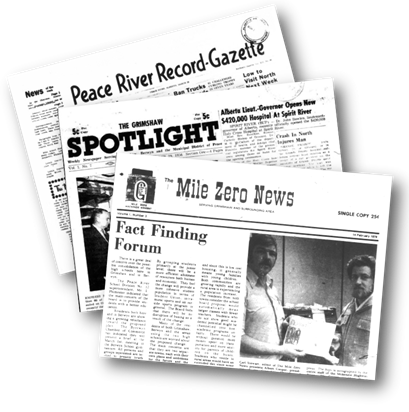 The Peace River District has a variety of weekly newspapers serving multiple communities within the region. A quick list of titles and abbreviations used in indexing the Peace area papers are featured in the right column. To have a deeper understanding for each newspaper and the community it serves, place of publication and start date, a list has been generated for the reader in PDF. For more information on other Alberta newspapers . . .
See, Gloria M. Strathern's Alberta Newspapers, 1880-1982: An Historical Directory › for more newspaper titles in the Peace area region. The Grande Prairie & District Branch, Research Committee will assist in filling your request. Our obituary index includes the Surrounding Community Newspapers from 1992 to present. For obituaries before or after these dates, please contact the Grande Prairie Branch. The library has a complete collection of newspapers for the district on microfilm. Entries vary with the amount of information given in the obituary. Each will have minimal information, such as: name, age, death and the title of the newspaper it originates in. Please view the database and submit your request by email or post. The service fee per obituary is $15.00. The cost includes a photocopy of the obituary, postage, plus title of the newspaper, date and page number. All payments are to be in Canadian funds. We accept cash, personal cheques or money orders. Sorry, we are unable to accept credit cards or PayPal.